After cutting curves in wood stock with a jigsaw or a band saw, the cuts need to be sanded. The best results come from an oscillating spindle sander, a tool dedicated to this kind of sanding task. If you don't have this tool—and many amateur woodworkers do not have space for every tool they'd like—you buy a sanding drum that fits a different woodworking tool, turning it temporarily into a perfectly functional spindle sander. If you're without a dedicated spindle sander, a simple solution is to use either your drill press or router table to do the job. On a drill press, it's possible to set the speeds much slower than on a variable speed router, but either will do the job. Sanding drums for spindle sanding are available at woodworking specialty stores, home improvement centers, and from online retailers. They come in various diameters, with 3/4" and 1-1/2" being among the most readily available. They are inexpensive, and refills come in various grits such as 50-, 80- or 120-grit. Make sure to buy a drum with the proper shank size. Small sanding drums with 1/4" shanks are available to mount in ordinary hand drills and some routers, but the drums used on a larger drill press or router table may require larger shanks if you don't have the proper collet size. 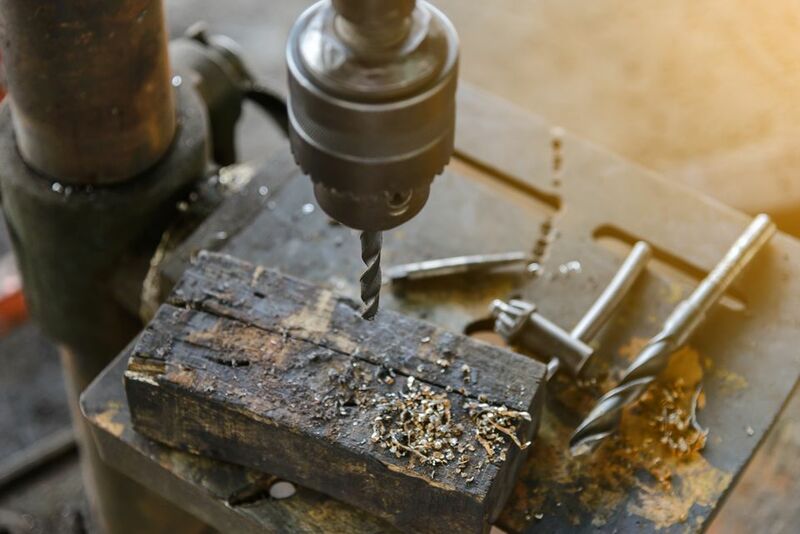 To use the sanding drum on a drill press, place the desired grit onto the drum and tighten the spindle (following the procedures that come with the drum's package). Then, place the shank of the sanding drum into the drill's chuck and tighten it securely. Raise the drill press' table until it is just below the spindle. Turn on the power and sand your piece, moving the piece against the rotation of the spindle. Experiences woodworkers have different recommendations for proper speeds for sanding using a drill press, but the ideal speeds will likely be between 1,000 and 2,000 rpm for most applications. Type of wood and sandpaper grit will affect the results, so be prepared to experiment a little. The procedure is similar should you choose to use your router table. Place the spindle into the 1/4" collet and tighten the collet, making sure that there is at least 3/8" at the bottom of the spindle and the top of the collet. Next, adjust your router's height so that the bottom of the sanding drum is just below the table's surface, with most of the sanding drum extending above the table. Be sure to set your router to the absolute lowest speed it's capable of, which is typically somewhere between 8,000-10,000 RPM. This is still quite a bit faster than ideal speed, but it works fine as long as you keep the stock moving so it doesn't burn. SAFETY NOTE: Do not attempt to use a spindle sander on a non-variable speed router. The 20-25,000 RPMs of a single speed router is much faster than a spindle sander is designed to operate. In a pinch, a sanding drum mounted in the chuck of an ordinary hand-held power drill can be used for sanding curves. The RPMs on a power drill are usually about 1200-1500, which is an appropriate speed for sanding. However, the biggest obstacle is in keeping the sanding drum perfectly parallel to the face of the cut when using a handheld tool like a power drill. If you try this, either find a way to mount the drill vertically or firmly clamp the workpiece and use the drill with sanding drum very slowly and take pains to sand parallel to the face of the cut.